Experience the tropical resort lifestyle at the luxurious Watermark on 4 acres of prime Waikiki location with world-class amenities. 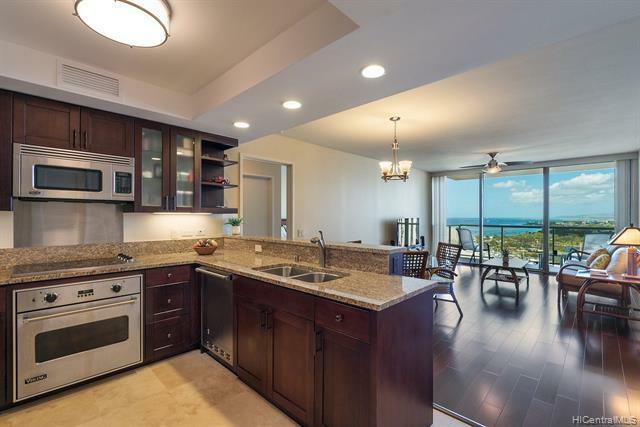 Ideally situated just minutes from Ala Moana Beach Park, Ala Moana Shopping Center, and Kakaako's Ward Village, this two-bedroom, two-bath with floor-to-ceiling windows boasts Pacific Ocean, Yacht Harbor & Ala Wai Canal views from every room. The high quality finishes include upgraded Ipe-Brazilian walnut hardwood floors, African Mahogany cabinets, granite countertops, Viking appliances, travertine floors in kitchen & bathrooms, a soaking tub & walk-in showers.. Enjoy the heated infinity pool & spa with lava rock accents surrounded by tropical landscaping, well-equipped fitness center, sauna, BBQ pavilions & grand open-air lobby with 24/7 security.